Pink Penguin: Placemats completed! I'm in LOVE! Placemats completed! I'm in LOVE! last week! I am extremely satisfied with the outcome!! of fabric, going back and forth to a fabric store. and I knew that I'd have to nail it. I used a bias tape of a different color. me an hour per place mat. Oh my goodness. hand-sewing but didn't expect to be that slow. lol. But I truly enjoyed each minute of it. Some were done in the train. Some were done while watching Dexter. "Hey, I want to make a quilt, but I am scared!" and I am itching to start making a quilt. unless I gave a shot. love them as much as I do..!! I really love your placemats. They are similar but still different, a really beautiful summery set. Almost too lovely to use! Love the colours! very cute! I've never been really into quilting - maybe because I have limited fabric to work on :P but seeing your work really inspire me to work on something - quilt ;).. maybe baby diaper changing mat? I am so inspired by you blog, I have to say!! Those placemats are really lovely. I like the white linen for a change from natural. As you know I make small things too, the idea of a whole quilt is just... well not something I'm likely to do! Maybe you could try a baby size quilt next? Those placemats are beautiful!! Compliment! I like all yours works! hi there so glad i found you on whip up you are a inspiration they are lovely...... also Dexter is very addictive i would have to agree!!!! I`m in love too !! But then I love most of what you do! Clever girl ! Lovely. The brainstorming process worked because they are adorable. The perfect summer table setting! Very Nice... Will make any table look inviting. Well done with the placemats. Don't be afraid to quilt - start with a lap size or a child's quilt and have some fun with it. You are already a creative spirit the rest will happen. Zesty, fresh and gorgeous. I work on little projects for instant gratification and also work on an experimental first time proper quilt as a long term goal, you've nothing to lose! 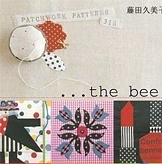 With your creativity, you will have NO problem with quilting. The placemats are beautiful. Why don't you start with a very small quilt? I make 'babyquilts' for cradles. I love your placemats! They are so bright and summery. 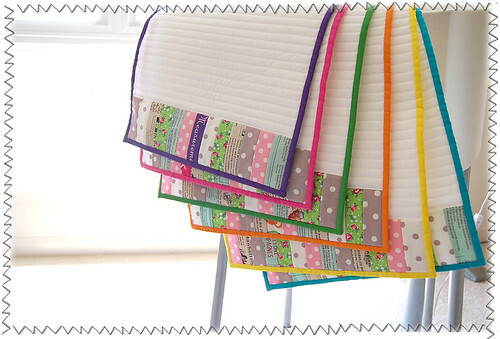 I love how each placemat has a different colored binding. Hand sewing the binding down does take alot of time. You can also completely machine stitch the binding on. 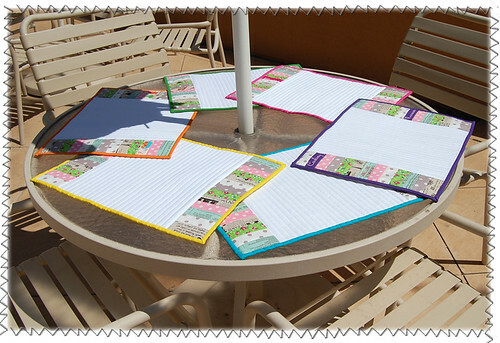 Now that you have made placemats you could always move onto a wall quilt or maybe a baby size quilt. Table toppers are also a nice manageable size. Yes, I'm sure they will love these placemats. I would. Beautiful colors. Great job. Love them! They are so cute. I am the same way about quilting, trying out smaller projects. I am also the same way about Dexter, I love that show! 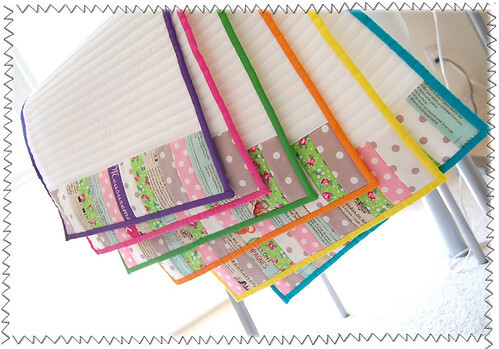 Beautiful placemats! I have recently made a few quilts and have been inspired by you to go smaller. I need some new placemats!! Got some great fabric from the Quilt festival in chicago. How big are your placemats? They look like the perfect size. ¡¡¡Son realmente precioso!!! y además no parecen difíciles!!! Muy buena idea, y siempre me gustan los trabajos que haces!!! Un beso desde Argentina!!! I am in love! Lucky person in Norway! I'm in love too! These are stunning! They are so great Ayumi. And you SO CAN make a quilt! You've practically made one if each of those placemats was just pieced together! Just think about some slightly bigger pieces of fabric than you are used to using and you'll be there in no time! These are gorgeous! You've totally inspired me - I so want to make placemats, but I can't decide on a pattern. This looks like a great idea. And I echo those above - you can totally make a quilt! Your work is beautiful! Would you post a tutorial? Thanks! These are so gorgeous and im loving all the wonderful fabric you used! You are an inspiration! Have a lovely merryhappy week and love to you! Great job Ayumi! Gorgeous work and they really do each have their own personality. Don't feel bad about slow hand sewing . . . I spent 5 hours hand sewing my binding onto a toddler sized quilt! Yikes! It was worth it though. Don't be afraid of making a quilt! It's SO satisfying! What other sewing project actually cuddles with you when you're done, and keeps you warm and cozy? :-) Go for it! cuteness! go for the quilt making, I'm sure you'll do awesome. For me the hardest part is making up my mind, too many choices! Oh, your placemats turned out absolutely gorgeous! I'm in love, too! I really like how you used different colors of binding. I'd love it if you post a tutorial. You could try making an apron out of quilt blocks, and then make a small quilt. 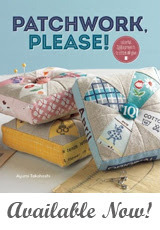 lovely project, great fabric choices too. Thank you for the inspiration. Wow those placemats look amazing!! I have just discovered your blog and it is awesome!! Would you be inclined to making a tutorial? I'd love to learn how to make those. simple yet pretty. the combination of the fabrics are lovely!! Your placemats are lovely, I am not sure I could bring myself to use them if they were mine! You are ready for a quilt!!! I can't believe you're not keeping them! They are delightful, and I don't usually like placemats. 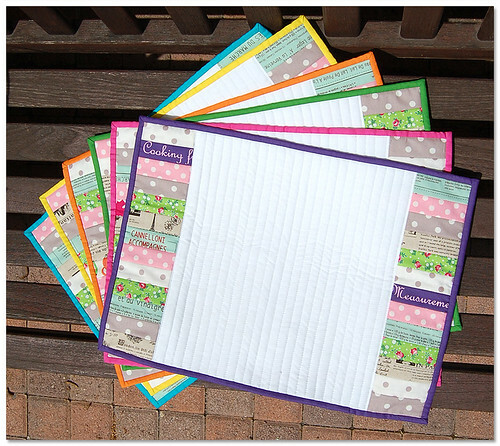 You will be wonderful at quilting! 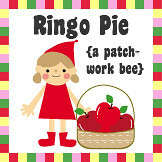 Very cute placemats and really interesting fabrics you've used. Well done! I just loved your blog, thank you so much for sharing a lot of diy. I'm just started to sew and I'm loving. Those are absolutely beautiful! I think you did a fantastic job! I always dream of making a quilt (made a baby quilt for my niece) but always stuck to small projects. Big projects scares me and I would need to cut into my fave fabrics (which is pretty hard ).